Technology and social media have given many groups outlets to freely express their ideals and perspectives. This is a good thing in that people can engage in open discussions in order to understand the perspectives of people not like them. Freedom of speech is important so that people not only can express their thoughts openly, but also be challenged to defend their thoughts as well as potentially learn from others. Speech and communication are powerful tools we use to relay not only our thoughts and opinions but to engage with others. Many use these tools to persuade others to see their point of view, switch sides, spread propaganda, push agendas, encourage hate, marginalize specific groups, and some negative motives. People are entitled to speak freely without fear of prison. Why? Because people should be able to say words if for nothing else to allow others to engage and correct wrong information. Oftentimes we see outrage on social media accounts, Twitter, Facebook, and the like when certain accounts get suspended, we read posts stating “it impedes their right to free speech”. Twitter and Facebook are not free assembly spaces the law protects. Let’s discuss Twitter. Twitter is a free service provided by others who pay for the space so the rest of us can engage in open discussion with each other. It is a privately funded service not offered by the government. Twitter is the world’s cafe or pub where people can go to hang out and interact. If you cause a disturbance in this privately owned cafe, you are asked to leave. 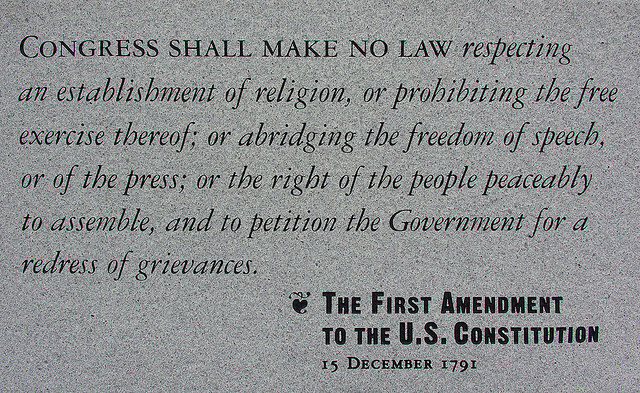 It is not impeding your right to free speech. It is the owner saying you’re upsetting everyone else and you need to leave. This example can also be seen in regards to discriminatory practices that gave rise to the Civil Rights movement. Notice, the protests were not in diners or cafes of people who did not want protests there. They were in public assembly of government regulated streets of towns and privately owned businesses. People have the right to speak out against what they feel is wrong without fear of prison in government regulated areas. XKCD gives a short and well said comic addressing free speech and that it is not “consequence free”. Your words (as long as they are not a threat of violence or harm to others) are protected to prevent you from going to jail. Your words are still yours and do not protect you from the court of public opinion. People of color who protest football games by sitting down and are fired later. They also receive racist verbal taunts protected under the law. Owners of teams can fire people anytime they want as long it is not based on any type of discrimination. People can also say their racist words without fear of jail. The man who released the “Google manifesto” to 40,000 employees (later went viral on the internet) suggesting men are superior to women in computer science was fired for his words. This man’s job is not protected by “free speech”. Google can fire him if they feel his actions cause harm to their business. People can also freely state their opinions on the matter. Phil Robertson was suspended from his TV show “Duck Dynasty” for making racist and homophobic comments. His suspension was quickly rescinded and the show continued on regardless of his words. The show has now ended. The point is that A&E could have cancelled the show and/or fired Robertson, but chose not to do so. They are within the rights allotted to their network. People were vocal about their opinions on this matter and could freely state them. The point to all of these examples is that the court of public opinion matters in your social status and to your employers. The court of public opinion is not regulated by the government. Only discrimination (which is hard to prove due to burden of proof and lack of substantial evidence) is regulated in regards to your employers because it is against the law. Employers are within their rights to weigh how your “court of public opinion” status affects their company and if it is a substantially negative impact. After all it is the public who consume what these businesses offer. If the public (on either side of the fence in regards to your opinion) is loud enough, the business will take notice. Your words matter and there are consequences/risks that must be noted. If an employer fires you for your words because they feel you’ve caused damage to their company, this is not impeding your right to free speech. You are not going to jail for your words. Likewise, if you are banned from Twitter, Facebook, or any online forum; this is not impeding your right to free speech. It is the owner of the cafe telling you that you’re upsetting the customers and are not welcome anymore. Let’s get back to Twitter and why this space is inherently useful in learning. I often get @’s (where someone can tag me in a public message) discussing opinions and perspectives of individuals who seek my thoughts, answers to questions, and any evidence I may have access to on a given topic. The whole purpose of my account is to direct people to reputable sources, educate, and give accurate information. If someone has better and/or more recent info on a topic, I welcome it wholeheartedly. The problem I run into involves certain individuals who think I am required to listen to them. They think they can speak without consequence. They state their opinions with snide comments, degrading terminology, bad science studies as references, and patronizing behavior. When I disengage, mute, block, report for harassment…as discussed previously…this is not impeding their right to free speech. I often get berated for not engaging. Sometimes I get told I am not a scientist because I am not engaging or responding to people who are emotionally charged and offended I won’t listen to them (as I’ve left the conversation due to circular arguments, rudeness, abusive language). What do I do? I point out what they say, how they act, and what their incorrect information is as an educational opportunity…not just for me to understand why these people think the way they do, but also that others know they exist and possibly why they think this way. I don’t truly expect every person who behaves this way to learn why it’s problematic. However, I am yet another voice of reason who gives them a moment to say their bit and point out (as I am certain others have) the fallacy in their arguments with calm and only sticking to evidence. Not only is it important for me (from time to time) to address such individuals as a means to show resistance to their process and thinking, but to give others an opportunity to perhaps learn something new about why individuals think this way. This is also an important practice as it holds those individuals to be accountable for their words requiring them to produce substantial evidence. I am a scientist and inherently curious of just about everything. It fascinates me that people ignore evidence and spout out whatever they wish thinking there is no consequence for what they say due to their misunderstanding to their “right to free speech”. As a scientist and former educator, I feel it is important that I listen/read not to respond per se…but to understand. I want to know why people think and feel the way they do…saying/quoting misguided/false info as factual. There is a danger in sitting back silently as numbers grow in pushing false information as fact and degrading integrity in effective problem solving processes. Louder voices promoting false information can gain a strong hold on society. One should also take note of not “giving a voice” to those who work to use your platform as a soapbox and grandstand. It requires caution and calm as well as knowing when to walk away…another reason why Twitter bans certain individuals as they can become abusive and harmful to others quickly. We need to actively learn and continue to research the root of this problematic speech and thinking as well as how/why it causes such effects on society. Science has worked to show us some evidence of the effects of speech on others. We can see through many societal studies focusing on just this one topic. (Google Scholar search of hate speech and societal impact starting from 2013). Yet, as it is often said, more research is necessary. Good science and bad science can be found on these engagements we see on social media…Through identifying bad science we can see bias in many aspects of it. Science uses its speech to call out bad science ruthlessly. Open discussion on scientific methods, funding, motives, allows us to find and amplify truth…recognizing the bad science is important as it is often used as a means to promote incorrect information to push harmful agendas to sway public opinion. It is important to call out bad science when it is used. As history has shown us, the court of public opinion does matter and louder voices can sway powerful positions including politics and business. Your words are important instruments of change as we have seen through peaceful protests in movements of marginalized groups. Your words can also be used to promote oppression of marginalized groups. Speaking as a scientist…we can not truly learn if we do not take in information on every aspect of a topic. Problematic speech and unfounded claims need to be understood in regards as to why it is being said. It also needs to be equally addressed with substantial evidence presented in a respectful way as the court of public opinion matters. It doesn’t need to be addressed every time, but when it is addressed…use it as a moment to learn why someone is saying the words and to teach others the correct information. Silence is not often effective in teaching…and it is powerful when implemented. Know when to use it. I’ve been interacting on the Web since 1996. There is a tendency for groups to moderate their forum to keep ideas they don’t want to consider from contaminating their safe space. I’ve seen it on IRC, on Usenet, and in Web forums. These venues always trundle along and die. Surrounding your mind with mental mirrors gets old very fast. On rare occasions, there have been venues that cultivate lively discussions. One IRC chatroom was founded by an Adventist who decided he would not ban a Catholic for explaining his or her beliefs, or an atheist for explaining his or her unbelief. The channel was actually founded when another one instituted the sort of thing that happened at Google with this engineer. The chatroom became a living thing that has survived for more than twenty years. I do not oppose Google’s right as a corporation to fire this fellow, and I’m not entirely clear if it rose to the status of a management memo, which would certainly earn a firing. But I would think twice before accepting a job at Google after it has effectively become a moderated chatroom. There is groupthink on the left and the right. I respect people who draw conclusions independently, even if I do not agree with those conclusions. See you out on Twitter, Mel! Pingback: Charlottesville and White Nationalism – A Perspective | "The Science Of _______"